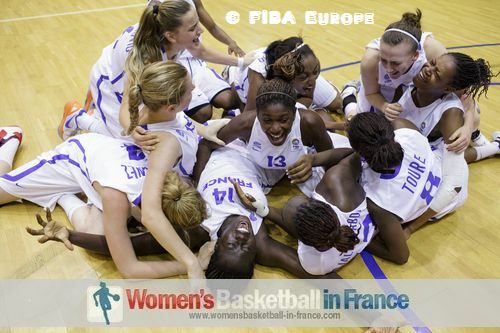 France are the 2012 FIBA Europe U18 European Champions for Women Division A after beating Russia in the final (65-61). 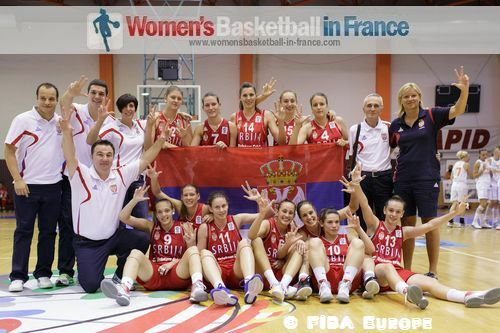 Serbia picked up the bronze medal after a comfortable victory against the Netherlands (59-46). 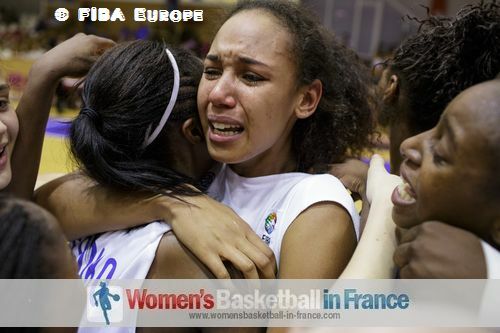 Spain clinched the last European place for the 2013 U19 World Championship by beating Turkey (71-60) in the match for fifth place. 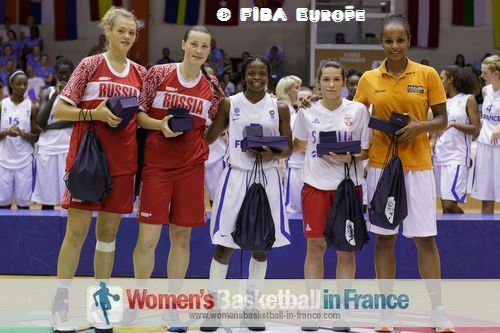 Olivia Epoupa from France was also voted the Most Valuable Player (MVP) by the coaches. The 2011 U18 European Champions Belgium ended up in 15th place and will have to play in the Division B championship next year. You may watch the highlights prepared by FIBA Europe from the final game with some after-match comments from Valeriane Ayayi. The opening minutes of the game were very physical with bodies flying all over the court. France came out second best in the early challenges. Valeriane Ayayi was almost knocked out in the first 45 seconds of the game after she was accidentally elbowed in the face. Marième Badiane (in picture below) from France was not so lucky after diving in to contest a rebound. She fell awkwardly and rolled her ankle after five minutes. Her game was over. The basketball in the Last quarter was interesting; France had more of the ball, won more offensive rebounds and should have led by 20 points but the ball just refused to drop. France's first points came from the charity stripes. Yet it was the Russians who took the early lead (4-2) with points coming from Alexandra Marchenkova and Albina Razheva. Lucikly for France Olivia Epoupa was in fine form. 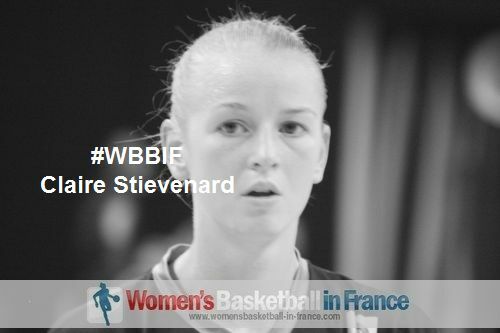 She scored 2 incredible baskets and was the live wire as France eventually edged the first quarter (14-8). 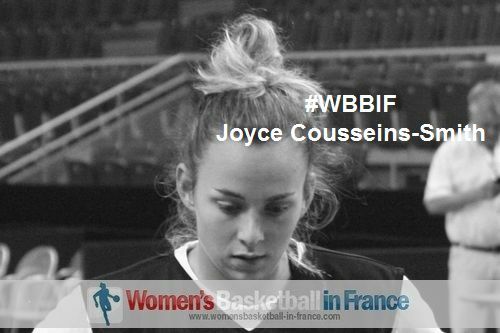 France continued to play at a high tempo and with 12 minutes played led (21-12). The Russians struggled to get into the French paint so reverted to perimeter shooting and fast breaks for the remaining of the second quarter. They also kept France scoreless during the last five minutes leading up to the interval while taking the lead (26-25). However the play of the second quarter was provided by Epoupa who managed to pick up an offensive rebound by diving for the ball and then catching it in mid air. Just before hitting the ground and going out of bounds she threw the ball back into the hands of Aby Gaye who scored. The third quarter was a youth basketball festival of youthful exuberance and great basketball. Marchenkova (20 points) was inspiration for Russia and her hook shots caused France all kinds of problems. In a chaotic quarter in which the game went back and fourth, it was the Russians that went into the final quarter ahead (44-43). Russia used a lot of energy to keep up with France. However they had no answer to Epoupa who scored 12 points during the final quarter to help France win their first ever U18 title. The last two minutes of the game were scrappy and the Russians came close to stealing the game. In the end a free throw by Lidija Turcinovic secured the victory with one second to play (65-61). Epoupa finished with 20 points, 12 rebounds and 5 assists. Serbia had a perfect start, leading (16-2) with five minutes played and ended the contest early in the second quarter (30-9). The Netherlands were short of ideas and tried to shoot their way back into the game. But with just 2-of-12 from beyond the arc they had no chance. For Serbia Aleksandra Stanacev led the way with 15 points while Natasa Kovacevic added 5 assists to her double-double of 11 points and 11 rebounds. This is Serbia's first podium finish since 2007, when they were the champions. Olivia Epoupa picked up her second FIBA Europe MVP award. In 2010 she was the winner during the U16 competition. She was joined in the all tournament team by Aleksandra Stanace from Serbia, Russian players Alexandra Marchenkova and Albina Razheva while Kourtney Treffers from the Netherlands completed the line-up. Romania were awarded the fair play prize. In the rest of the day's action Spain secured 5th place with a win against Turkey (71-60) and a place at the 2013 FIBA U19 World Championship for women. Pelin Bilgic led the way with 16 points. Croatia claimed 7th place with a comfortable win over Italy (72-49). In the other classification games the Slovak Republic won the 9th place game against Sweden (70-55) while Greece had to settle for 11th after beating Slovenia (58-55). The Czech Republic made it six wins out of six in the relegation group with a (64-60) win against Belgium while Poland defeated hosts Romania (76-36). Poland, Belgium and Romania will be replaced by Belarus, England and Portugal next year.